After too much trouble trying to share with my readers linkies and other items, I’ve decided to transfer Literacy Toolbox over to my own hosted site. You can now find Literacy Toolbox at www.literacytoolbox.com Please head over and subscribe there! But, also register (on the much easier to use linky) for the Summer 2011 Reading Challenge! I have extended the sign up period through June 17th. Thank you so much for your dedication and patience to Literacy Toolbox as we go through these changes! And a big shout out and thank you to Chris Singer of www.chris-singer.com for helping me transfer Literacy Toolbox and get it up and running! Earlier this month I had the opportunity to interview Pam Allyn about her new book, Pam Allyn’s Best Books for Boys: How to Engage Boys in Reading in Ways That Will Change Their Lives and I also reviewed the book in a subsequent post. I am always on the lookout for great books for boys so when I was offered the chance to review Monster Comics , I agreed. The title itself screamed “boy” to me. I gave it to my son and let him read it at his pace. He recently picked it up and can’t put it down. It has become part of his nightly ritual. This book is part of the bestselling series, Comics to Go!. In his first book, Comics to Go: 19 Stories for You to Finish! Herrod provides the beginning to many different stories, and expects the reader to complete them. Children also have the opportunity to write their own comic strips from beginning to end. What a fantastic way to combine reading and writing, especially for those readers who might need a little nudge! Both books would be fun books to have on hand for summer vacation. Don’t forget to sign up for the Summer 2011 Reading Challenge to motivate readers! Disclosure: We received this book to review from the publisher. Over the years, in schools I’ve taught in we’ve sent home summer reading packets. Many schools think kids will continue reading over the summer if they are given a packet of activities to complete when they read. This (typically optional) packet of activities is turned in when school begins and children usually receive some kind of reward in return. Unfortunately, extrinsic rewards do not usually result in children reading more (or enjoying it!). We are better off if we motivate our children to read with intrinsic rewards – the idea that they want to read because they want to read and it makes them feel good! Yet, time and time again, research has shown that children lose what they learn over the school year if they don’t continue reading and writing over the summer. I get why schools insist on sending home packets – it’s to keep kids learning, but it’s not very motivating. This summer, instead of encouraging my son to complete tasks he’s not really interested in, I decided to appeal to my son’s very healthy sense of competition (a typical trait of boys) by challenging him to read independently over the summer. I mentioned this idea to him and he loved it! He won’t be in competition with anyone but himself. This has led me to create my first community challenge. So welcome to Literacy Toolbox’s Summer 2011 Reading Challenge! I hope you will join us! Goal: Challenge your child to read independently this summer. Encourage your child to graph his success! If you would like to download a Total Number of Books Read in Summer 2011 graph to use, you may do so here. Or involve your child in making one of his own. Especially if your child plans to read more than 20 books a month! I, personally, joined my own challenge this year – The Centurions of 2011 that high school teacher Paul Hankins started. My challenge is to read 111 books in 2011. I keep track of the books I read each month and share the titles with the group at the end of the month. I don’t graph my results, but may do so over the summer to share in the experience with my son. 1. Sign up below by May 31, 2011. The challenge will run from June 1 through August 31, 2011 and is open to independent child readers. Head over to the NEW Literacy Toolbox to sign up! 2. Plan to begin on the first day of your summer vacation, but for the purpose of this challenge, we will include any reading that your child does between June 1 and August 31. Encourage your child to read independently every day. 3. Plan to check back here on the last day of each month (June 30, July 31, and August 31) and share the number of books your child read that month and a couple of favorite titles. You may do so by leaving a comment on the page or by writing your own post on your blog (if you write one) and linking to it on the last day of the month here. 4. Prior to starting, ask your child to make a goal for the month. How many books does he think he can read in one month? Perhaps differentiate between the number of picture books and the number of chapter books. Do this at the beginning of each month. At the end of each month, discuss whether your child met his goal. If he did not, ask him if he should do something differently to meet the goal he sets for the next month. If he exceeded his goal, ask him why he thinks he may have done so. 5.Encourage your child to keep track of the number of books he reads each day. Consider making a special journal to keep the title of books read. This will help him keep track of the total number of books he reads, but also serves as a reminder of titles that he can look back on when looking for a new book to read. Help him graph the total number of books he reads each month. 6. Consider joining your child in the challenge. In other words, challenge yourself to read independently along with him. Set goals, keep track of the number of books you read, and graph your results. This is a great way to model for your child what “real readers” do. Real readers might not graph their results, but they certainly set goals and re-evaluate them. 7. Most of all…have fun! On Tuesday, I had the pleasure of interviewing Pam Allyn here on Literacy Toolbox. In that Q&A session, she shared her professional insight into what has influenced her work with boys, any misconceptions society has about boy readers and her advice to parents of boys. I’m delighted to have been able to read her new resource for educators, Pam Allyn’s Best Books for Boys: How to Engage Boys in Reading in Ways That Will Change Their Lives (Scholastic 2011) and review it here. About the Book: In this resource, Allyn thoughtfully begins with the why. Why the focus on boys? It’s an age old question at this point. How do we get boys to read as much as girls? Why is there a disparity between boys and girls in reading? In the second section, she provides the reader with 24 questions and answers related to reading and boys, such as: How can we make boys comfortable with reading? Does online reading count? How can I celebrate and affirm boys’ achievements in reading? Allyn ends with an extensive annotated list of books that boys may enjoy. She explains a coding system – labeling books with E-for Emergent Readers, D – for Developing Readers, and M – for Maturing Readers – that has more to do with a boy’s emotional development rather than his chronological age. Books are listed by genre – genres that boys typically like. My Thoughts: This is a fantastic resource for any educator who is interested in motivating boys to read. It’s an easy read and provides thoughtful, ready to implement ideas to motivate boys to read in the classroom. And, while it’s technically a resource for educators, I think parents can certainly glean useful information from this resource as well, in terms of ways to encourage reading in boys. The language is not written in “educator vocabulary,” but instead, is rather parent friendly. If you have sons or are a teacher of boys, I highly recommend you read Pam Allyn’s Best Books for Boys: How to Engage Boys in Reading in Ways That Will Change Their Lives ! About the Author: Pam Allyn is the Executive Director of LitWorld. She is also the Executive Director of LitLife, a nationwide education professional development consultancy. Pam has written several books for teachers including the curriculum development guide entitled “The Complete 4 for Literacy” (Scholastic 2007) and one for parents, caregivers and educators entitled “What to Read When” (Penguin 2009). Disclosure: I received a copy of the book from the publisher. I am honored to share with you my first Author Q & A on Literacy Toolbox. Pam Allyn’s Best Books for Boys: How to Engage Boys in Reading in Ways That Will Change Their Lives (Scholastic 2011) is a new resource for educators, but I think parents can certainly glean useful information from it in terms of ways to encourage reading in boys. I will review the book here on Thursday! In the meantime, read what Pam has to say about literacy and boys. Please tell Literacy Toolboox readers a little about yourself. What was your impetus to begin Lit Life and Lit World? I HAVE LOVED WORDS AND STORIES FOR AS LONG AS I CAN REMEMBER. MY PARENTS’ VOICES READING ALOUD TO ME AND THE NEARNESS OF THEM ARE AMONG MY VERY FIRST MEMORIES. WHEN I BECAME A TEACHER I SAW OVER AND OVER HOW FOR THE MOST MARGINALIZED CHILDREN, BOOKS AND STORIES BRING THEM INTO COMMUNITY AND LOVE AND CONNECTEDNESS. MY FAMILY IS A FAMILY OF TEACHERS. MY GRANDMOTHERS WERE BOTH TEACHERS, AND I GREW UP WITH A SENSE OF THE POWER AND MAGIC OF TEACHING, AND WHAT AN HONORABLE PROFESSION IT TRULY IS. I FOUNDED LITLIFE TO PROVIDE TEACHERS WITH THE CRUCIAL SUPPORT THEY NEED TO BE THE STRONGEST THEY CAN BE. THERE’S A LOT OF TALK ABOUT EFFECTIVE TEACHING, BUT I THINK YOU CANNOT BE AN EFFECTIVE TEACHER UNLESS YOU FALL IN LOVE WITH BOTH THE CRAFT AND SKILL OF TEACHING AND THE CHILDREN THEMSELVES. I FOUNDED LITWORLD IN 2007 AFTER MY WORK WAS RECOGNIZED INTERNATIONALLY AND I HAD THE OPPORTUNITY TO TRAVEL TO KENYA AND LIBERIA AND SEE FIRSTHAND THE SUFFERING OF CHILDREN WHO ARE DEPRIVED OF EDUCATION, AND MOST PARTICULARLY, OF LITERACY. I BELIEVE LITERACY IS A HUMAN RIGHT, NOW SO MORE THAN EVER BEFORE, GIVING US ACCESS TO HEALTH, INFORMATION AND INSPIRATION. ALL CHILDREN DESERVE THIS RIGHT. Who are your literacy mentors in the professional field? Why? MY LITERACY MENTORS INCLUDE BARRY LANE, JIM BURKE, NAOMI SHIHAB NYE AND GEORGIA HEARD. THEY ARE ALL PEOPLE WHO STAY TRUE TO THE INNER LIVES AND DIGNITY OF CHILDREN AND TEENS NO MATTER WHAT THE LATEST TRENDS ARE OR THE PRESSURE BEING PUT ON SCHOOLS. THEIR WORK STAYS TRUE BLUE TO THEIR CALLING AND IT IS MIRACULOUS WORK: BOTH USEFUL AND PRACTICAL BUT ALSO POETIC AND MAGICAL AT THE SAME TIME. A VERY RARE COMBINATION. I AM ALWAYS GRATEFUL TO LUCY CALKINS FOR TURNING THE LIGHT ON FOR ME WHEN I WAS A GRADUATE STUDENT AND LATER CAME TO WORK WITH HER AT A TIME IN NEW YORK CITY WHEN THE TEACHING OF WRITING WAS MORE THAN A PRACTICE, IT WAS A MISSION. THOSE WERE VERY EXCITING TIMES, AND I WAS SO GLAD TO BE A PART OF THEM. FINALLY, THE GREATEST TEACHER OF ALL WAS PAOLO FREIRE. HE BELIEVED IN THE PERSONAL STORY AS THE CRUX OF ALL LEARNING AND THE TOOL THAT WOULD MAKE IT POSSIBLE FOR EVERYONE TO LEARN TO READ AND WRITE. HE IS ALWAYS WITH ME, AND AS A RESULT THE POWER OF THE STORY IS WHAT FUELS MY WORK EVERY DAY. Who are a few of your favorite authors of children’s literature? I SO LOVE CHARLOTTE ZOLOTOW, WALTER DEAN MYERS, CARMEN AGRA DEEDY, LANGSTON HUGHES, MO WILLEMS, LAUREN CHILD AND NIKKI GIOVANNI. Which one children’s book has had the most influence on you and why? CHARLOTTE’S WEB IS THE PERFECT BOOK, BECAUSE IT IS NOT JUST FOR CHILDREN. IT IS FOR ALL OF US. IT IS ABOUT COURAGE AND LONELINESS, SORROW AND JOY. AND ALL OF THAT ABOUT A PIG! IT IS A MIRACULOUS BOOK IN EVERY WAY, FROM THE BIG IDEAS TO THE TINIEST GRAMMATICAL POINT. IT IS A MASTERPIECE. BUT BEYOND ALL THAT IS THE FACT THAT THE CENTER OF THE BOOK IS FERN, A TEN YEAR OLD GIRL WHO WATCHES AND LISTENS CAREFULLY AND VALUES FRIENDSHIP AND THE HUMAN HEART. HE NAILED IT. In the last several years, much has been written about the differences in learning between boys and girls. How has this influenced your work with boys? I DO BELIEVE THAT WE HAVE NOT CREATED CLASSROOMS THAT ARE SANCTUARIES FOR ALL KINDS OF LEARNERS AND BOYS REALLY SUFFER IN THAT. THE MAIN MESSAGE SEEMS TO BE: SIT QUIETLY, CONFORM TO EXPECTATIONS, BE OBEDIENT. THESE ARE NOT GOOD MESSAGES FOR EITHER GENDER, ESPECIALLY IN AN ERA WHEN WE ALL SHOULD BE ENCOURAGING BOYS AND GIRLS TO BE INNOVATORS AND THINK OUTSIDE THE BOX. I AM CONCERNED ABOUT THE RESULTS FOR BOYS AT THE END OF HIGH SCHOOL AND HOW MANY MORE BOYS END UP IN PRISON AND LACK LITERACY SKILLS THAN GIRLS. IT IS A REAL CRISIS HERE IN THE UNITED STATES. IN MY WORK WITH BOYS, FIRST AND FOREMOST I WANT THEM TO FEEL A PART OF A READING COMMUNITY AND TO VALUE WHAT THEY READ AND HOW THEY READ, EVEN IF IT’S NOT INSIDE A CHAPTER BOOK WITH A MEDAL ON IT. Are there any misconceptions society may have about boy readers? WE THINK BOYS DON’T LIKE TO READ WHEN IN FACT MANY OF OUR BOYS ARE READING CONSTANTLY! THEY MIGHT BE READING VIDEO MANUALS, OR TEXTS, OR INTERNET SITES AND NOT THE AGE OLD CHAPTER BOOK SO WHAT WE DO IS WE VALUE THE BOY LESS AS A READER. I WANT TO CHANGE THAT. IT’S ALL READING. Which children’s book character (or type of character) do boys typically connect with? Why? BOYS TEND TO (AND I DON’T WANT TO GENERALIZE WHICH IS WHY I SAY, TEND) LIKE CHARACTERS LIKE THEMSELVES; BOYS! THEY LIKE BOYS WHO MAKE MISTAKES, WHO ARE HUMAN BUT ALSO DO SOME VERY COOL THINGS. THAT’S WHY HARRY POTTER IS AN INSPIRATION. HE’S A PLAIN OLD BOY WITH A SCAR ON HIS FOREHEAD BUT HE FINDS MAGIC ANYWAY. What advice can you give to parents of boys to encourage them to read? MODEL YOURSELF AS A READER TOO! PUT DOWN YOUR DISTRACTIONS AND CREATE TIME FOR READING TOGETHER AT HOME. IF WE ARE TELLING OUR KIDS TO READ BUT SPEND ALL OUR TIME FLITTING FROM ONE CELL PHONE TO THE NEXT, WE ARE NOT SENDING THE MESSAGE OUR BOYS WILL UNDERSTAND. SIT DOWN TOGETHER. BE READERS TOGETHER. What five books would you recommend for boys between 4-8? What suggestions do you have for parents to help their sons maintain their reading over the summer? PARENTS MUST BE POSITIVE ABOUT THEIR SONS AS READERS. KNOW YOUR SONS AND BRING THEM BOOKS OR FIND BOOKS WITH THEM THAT REFLECT THEIR PASSIONS. BE A READER TOGETHER WITH YOUR SONS. EXPAND YOUR VIEW ABOUT WHAT MAKES A GOOD READER AND DON’T BE JUDGMENTAL. IF THEY LIKE TO READ CEREAL BOXES, COMPLIMENT THEM AS READERS! HAVE FUN! Pam Allyn began her career as a teacher. She is now the Executive Director of LitWorld. She is also the Executive Director of LitLife, a nationwide education professional development consultancy. Pam has written several books for teachers including the curriculum development guide entitled “The Complete 4 for Literacy” (Scholastic 2007) and one for parents, caregivers and educators entitled “What to Read When” (Penguin 2009). April was not as busy as March was at Literacy Toolbox. I took a little time off this month to spend Spring Break with my kids. We had an enjoyable week, but we still had some time to get some literacy learning in this month! April was National Poetry Month, so we began by sharing the month long Global Poem for change that Lit World is creating. If you haven’t had a chance to check it out, do so today! You are invited to submit a line of poetry to the growing poem at the Lit World website. This post provided a brief look at one of my favorite poetry books. I also provided a fun little activity you can do related to the book. This is a sponsored post by WordWorld. WordWorld is a fantastic educational cartoon on PBS. It teaches children letters, phonics, and phonemic awareness. My daughter loves it and in this post I’ve shared some activities you can begin to do with your pre-reader. This is a great picture book to teach children a little about folktales, greed, and selfishness. There are several teachable moments in this book and I share them at this post. And that is Tool Time Rewind for the month of April. Coming up next month, you’ll find a review of a resource for finding books for boys as well as a Q&A with the author! Additionally, I’m going to announce a challenge I’m cooking up! Come back in May and see what we have in store for you! The Greedy Sparrow: An Armenian Tale is a new book to help you teach your child about greed, selfishness, and using good judgment. In this retell of an Armenian folktale, a trickster sparrow takes advantage of people, trading items he has “taken” all to further his ambition of becoming a minstrel. However, the surprise ending shows us that manipulation and trickery are not rewarded. You know me. . . I’m always looking for the teachable moment in a book! This book does not fail! The Greedy Sparrow: An Armenian Tale has many teaching possibilities, beginning with a simple discussion of oral folklore and how it is passed down from generation to generation. This story may have never been retold in book form, had the author not heard the story from her own father. The story is complemented with bright and colorful folk-style illustrations and the dialogue is in speech balloons. On a higher level, one may choose to discuss Armenian traditions as experienced throughout the book. And beyond that, you may choose to discuss how the sparrow goes about asking for help and then becomes greedy in each successive “find.” Finally, April is Genocide Memorial Month. The ancient Armenian oral tradition was nearly obliterated during the Turkish genocide of the Armenians in 1915. Without this oral tradition, this story may never have been heard and able to have been written in picture book form. So, really depending on the age and developmental level of your child, there is a lot to work with when reading this book! This book is intended for readers ages 4-8, but I think that parents and teachers of children as old as high-school age can find ways to use this book as a springboard to discuss a variety of topics. It’s hard for me to believe, but my baby girl will be five next week. FIVE! She will begin kindergarten in the fall. As a mother and an educator, I have made an effort to find a balance between just being mom, yet providing learning opportunities for my children. One thing I have always encouraged, but never pushed is reading. I have read to my children from the time they were born. Not a day goes by that we don’t read something. I believe that it’s this full immersion in language that has created readers out of my children. I never once pushed my son (eight years old, now) to read before he started kindergarten, yet he was reading above grade level when he began kindergarten – and I had no idea! I had no idea, because I simply didn’t push him, I let him learn to read at his own pace. My daughter, on the other hand, is showing signs way before kindergarten begins of wanting to read. She is already reading a few Mo Willems books to me and she knows about fifty sight words. Again, I have done nothing out of the ordinary with my children except read to them every day. Oh, and I have also provided a print rich home for them. We have books on every floor of our home and magnet letters on the easel. And, I allow them to watch educational TV shows. One show my daughter enjoys watching is WordWorld on PBS. I don’t mind her watching, because I know it’s educational and she is learning how letters make sounds and connect to make words. But, I do like to make connections to what my kids are reading or watching. And, actually, making connections is a comprehension strategy that they will use as they become proficient readers (so, in a way, I’m prepping them for their future reading endeavors!). We saw the word duck in the last episode of WordWorld we watched. What other words might sound like duck? And then she will tell me words that rhyme with duck. I write them down in a list under the word duck and then she will determine if they are spelled the same way. This is a good way for her to learn chunks, but also begin to recognize some blends such as ch- or tr-. 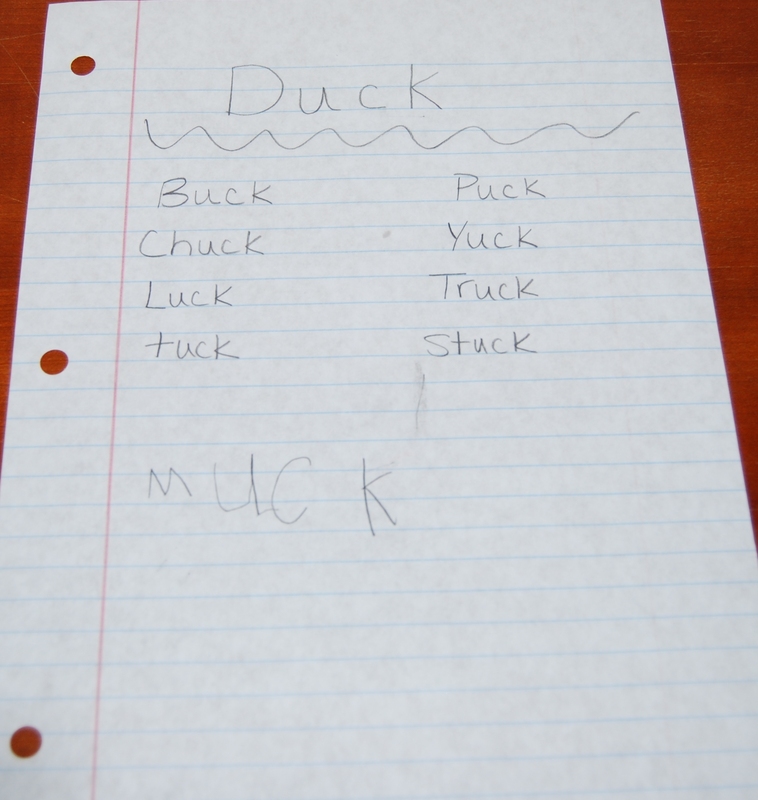 She also has an opportunity to begin to write words using the chunk as you see with the word, muck. 2. WordWorld also provides episode related activities on their website. I like the connections that the activities make to the actual show and the learning that continues from the hands-on fun we have. Research has shown that preschoolers learn best through play. I feel better about TV time when I know that my children are watching something educational and then we are extending beyond that TV show into more learning in a hands-on, educational way. And there are a TON of episode related activities that extend beyond the show and into the realm of hands-on, literacy learning. 3. I’m a fan of “literacy on the go.” As a child, I always had a book with me. I encourage this for my children as well, who will often bring books with them even for short car rides somewhere. However, if we forget a book and we find ourselves in a situation where we are waiting, most times one or both of the kids will ask for my iPhone. I don’t have a problem if they use my iPhone, because I have packed it with educational games and books. One app my daughter just became familiar with is “Snug as a Bug” which is an e-book app offered by WordWorld. This particular book uses the same “word things” that the show uses. She can have the book read aloud to her or she can turn the speaker off and read it herself (she isn’t there yet!). There is some interactivity in the book, which keeps her engaged. The great thing is WordWorld offers these e-books as apps on iTunes for the iPad or iPhone, but they also offer them for FREE on the Word World website. The e-books are read-aloud versions of the actual TV episode, so after reading the book, you and your child can compare the e-book to the episode. How do you help to build a reader, one word at a time? Do you allow your children to watch educational TV? How do you connect literacy to TV? Paint Me a Poem: Poems Inspired by Masterpieces of Art is one of my favorite books to read with my children because I like the premise of the book. As the author walked through the National Gallery of Art one day, she was inspired by the paintings she saw, and in her head began to hear music. The music became a poem and this book is a collection of thirteen poems inspired by famous artwork. Activity: Read aloud this book with your child and talk about the pictures and how the author wrote the poetry. If you have an art museum nearby, consider taking your child to it and peruse the paintings. Determine a favorite painting and purchase a small postcard in the gift shop of that painting. When home, encourage your child to write a poem based on the painting. If your child can’t write yet, ask him to dictate a poem to you. If you don’t have a museum nearby, use a piece of your child’s own artwork to inspire a poem. Or, use photographs or pictures from magazines. It’s not the poem that matters, but the experience of relating a picture into words. “Reading” pictures is a precursor to actual reading, so if your child isn’t reading yet, this is a fun activity to do anytime, but especially during National Poetry Month! Submit a line of your own at litworld.org/poem and watch our Poem GROW at litworld.org/poemblog. We need Your Words to Change Worlds.